We do a lot of custom builds, but love the opportunity to do a spec home project. Below are a couple of our current for-sale homes or lots. Browse through the details below and give us a call to talk more. 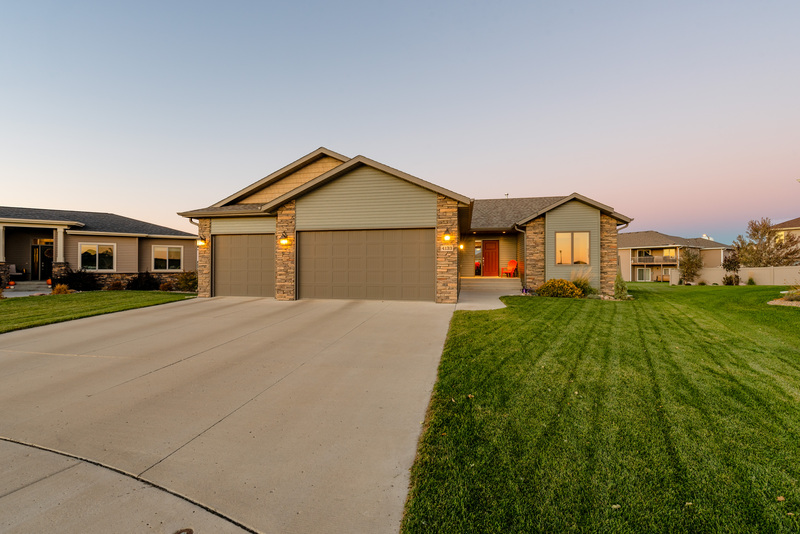 This ranch home on a quiet street in North West Bismarck’s Eagle Crest, Third Addition, offers the best part of new-construction, without the hassle of finishing the project. It sits privately in the corner of a cul-de-sac-like street with a large, mature yard, completed landscaping, underground sprinklers, and a mix of evergreen, apple, and maple trees planted — all ready for you to enjoy. The main floor is highlighted by an open, yet cozy living space, whose vaulted ceilings bring an airy feeling and accentuate the finishes. Real hardwood floor pairs with plush carpeting. The kitchen’s custom, knotty alder cabinetry flows seamlessly into the custom handrail and detailed wooden trim throughout the house. Vaulted ceilings, real hardwood, great space. Privately separated on it’s own side of the house, the master suite again feels airy and bright with a tray ceiling, lots of space, his and hers closets, and dual sinks. And, it’s just a few steps from the main-floor laundry room. Large Master, his and hers closets, dual sinks. Big news — whether for entertaining or just relaxing with the gang! Plumbing and electrical are ready to go for you to create your dream bar in this huge space. 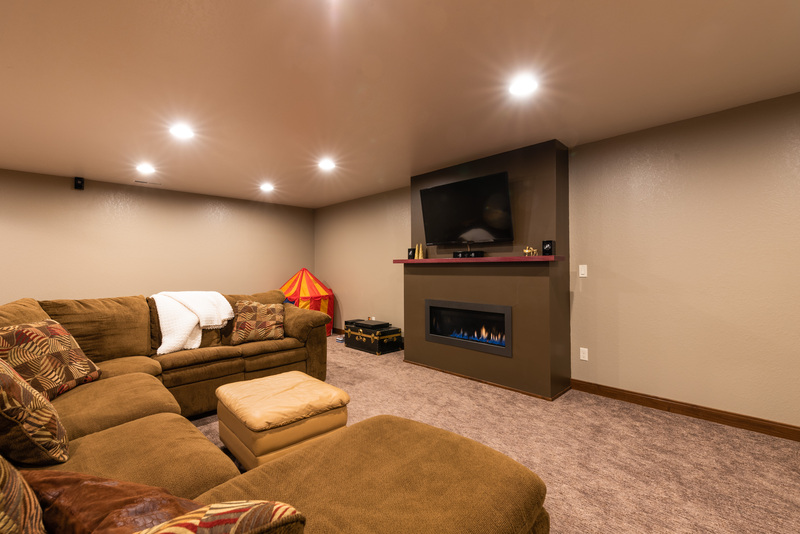 Daylight lower level family room and, if that’s your thing, it’s ready for your dream bar. 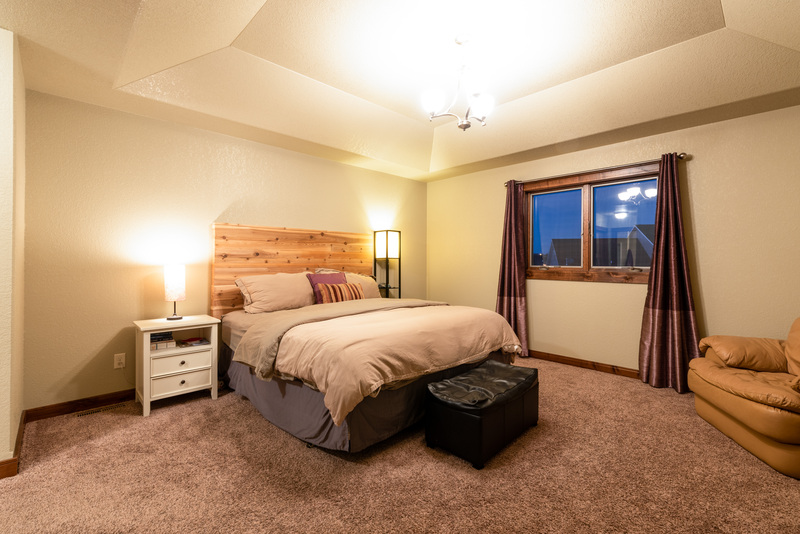 Two more bedrooms, a full bathroom, and lots of storage wrap up the lower level and what is a wonderful home, with all the quality touches we’ve become known for, that is just like the day we built it. And you can’t beat the fact that it’s in one of the most desirable, scenic, family-friendly neighborhoods in Bismarck. Take a quick tour via the photo gallery. Then, give us a call when you’re ready for your own walk-through. 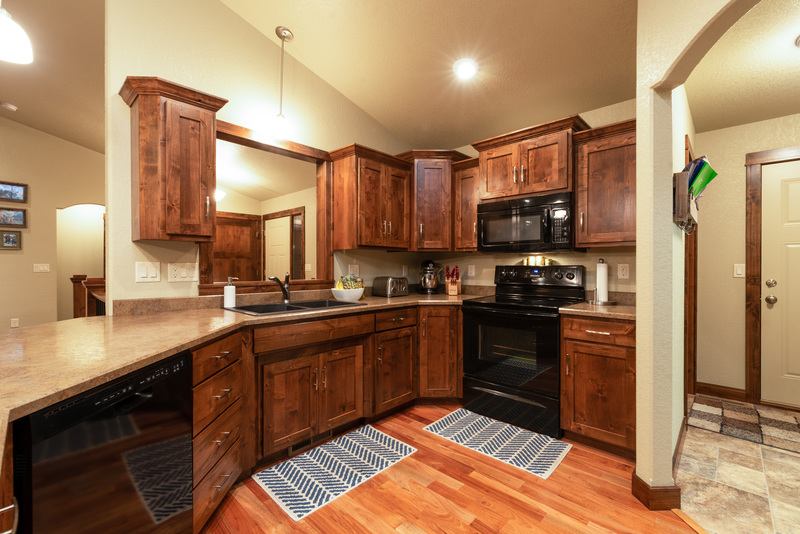 Finished in 2012 by Vetter Homes, Inc. 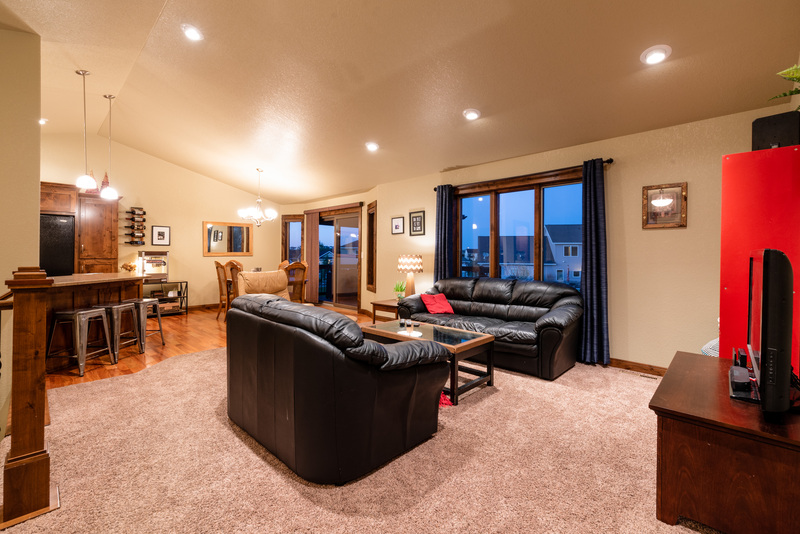 Enter into an open living space with wonderfully vaulted ceilings. Hardwood through the dining and kitchen areas. Counter seating leads to the custom kitchen and back entry. 12,000 sq. foot lot with established landscaping. Master with His and Her closets. Main level laundry, close to the back entry. Daylight lower level family room. 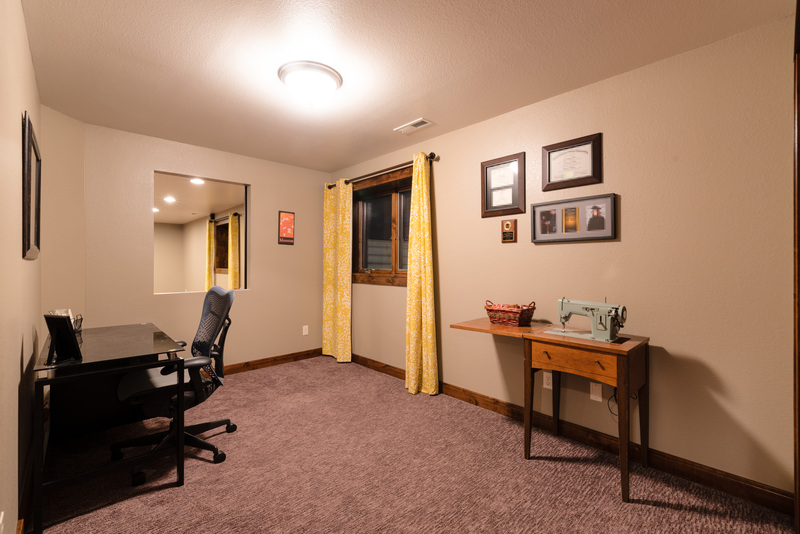 Lower level family room, with the barn-door privacy closure for the office and ready for your bar install. Give us a call to take a closer look at The Ranch Home, on Ranch Loop.